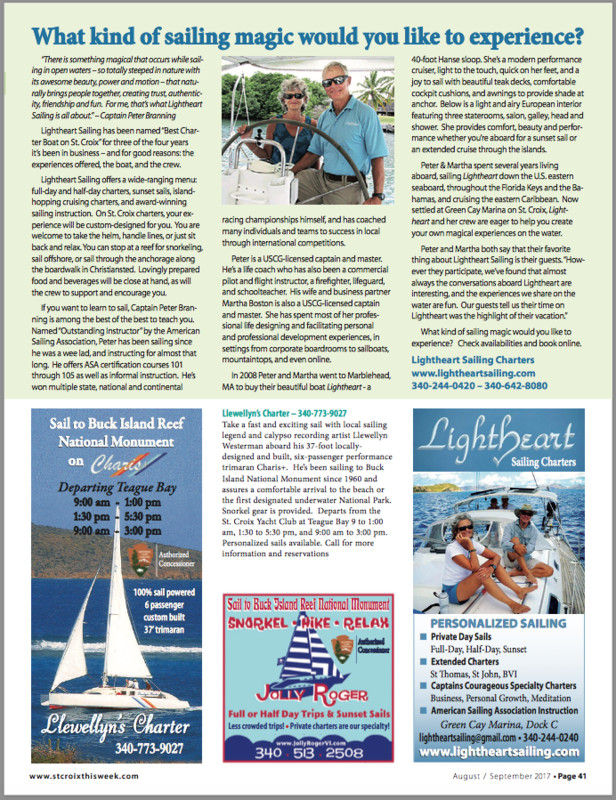 Peter Branning and Martha Boston are the owners and operators of Lightheart Sailing, based in Green Cay Marina on St. Croix in the U.S. Virgin Islands. Originally from Florida and Texas respectively, they found s/v Lightheart, their Hanse 400 sailboat, during the summer of 2008 in Marblehead, Massachusetts. From there, they spent five months cruising the Eastern Seaboard, including Long Island Sound and Chesapeake Bay, finally arriving in Miami where Lightheart was put into service for charters and sailing instruction. On Lightheart, Peter and Martha sailed throughout the Florida Keys and the Bahamas for several years. They then turned south and cruised the Caribbean island chain as far south as Tobago, exploring most of the islands along the way. They came north to the Virgin Islands in 2012, where they have made their home among some of the best sailing and cruising grounds anywhere. Lightheart is a 2007 Hanse 400e, a modern performance cruiser that is extremely responsive and light to the touch. She's also a comfortable cruising vessel with an elegant European interior - light, airy and spacious with wood and leather appointments. She sleeps six in three staterooms: forward king, aft queen and aft over-sized double. Her generous head has a full separate shower, and there is a stern shower as well. The galley is well-equipped and easy to use. Lightheart has beautiful teak decks, comfortable cockpit cushions, and awnings to keep you shaded at anchor. Add in her barbeque, snorkel gear, floats, and optional paddleboards, and you are set for a wonderful and memorable vacation. See our gallery.